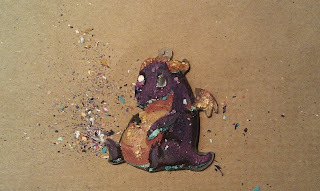 I wanted to make another button design for Wondercon, and I thought this little happy fat dragon would be perfect! So I cleaned up my sketch and painted her in photoshop. Then my cousins brought home some really awesome, crafty things called shrinkydinks. If you dont know what they are- like I didnt- check them out, you can make some really cool things with them! ShrinkyDinks!! 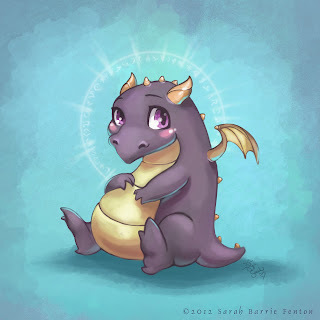 I thought, oh how cool, I wanna try my baby dragon! It said acrylic paint was ok, so naturally I assumed gouache paint would be fine too. I recreated my baby dragon on some magical shrinking plastic. And then we baked her! Moral of the story, do not bake gouache. As my friend Ann put it- "This is what it looks like when things in Sarah's world die, they explode into a bomb of glitter and then gently float away into the sunset." My poor baby dragon. Shes roughly the size of a quarter and totally exploded. 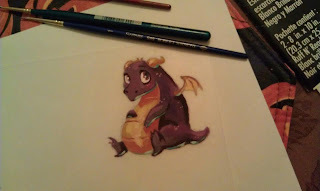 Next experiment will be with markers, and I've ordered the printable shrinkydink paper too, so we'll see where this goes!